The televised presidential debates are the mega-events of the fall campaign. Stakes are high as the candidates face each other, across a single stage, within a month of the election, before a television audience of tens of millions of people. A debate can reveal the candidates' differences and ability to think on their feet or it can devolve into a scripted exercise bordering on a joint press conference or into an exchange of soundbites. When it comes to the number, timing and formats of the debates, as well as who will participate, there is a lot of discussion, but invariably the major party candidates and their campaigns have the final word. Each campaign acts in its own best interest; it wants to create the most favorable possible set of circumstances for its candidate. October 8, 2004--President Bush makes a point during the second of three presidential debates, held at the Washington University in St. Louis. The Commission on Presidential Debates (CPD), a non-profit organization established in 1987, organized the 1988, 1992, 1996, 2000 and 2004 debates. Previous debates were sponsored by the League of Women Voters (1976, 1980, and 1984) and the networks (1960). The CPD develops candidate selection criteria which are used to evaluate which candidates it will invite to participate. It proposes dates and locations of debates. It lines up corporate sponsors and oversees preparations for these important events. Moderator: Jim Lehrer -Anchor and Executive Editor, The NewsHour, PBS. more > Format: Candidates seated at a table with the moderator. Moderator: Gwen Ifill -Senior Correspondent, The NewsHour, and Moderator, Washington Week, PBS. more > Format: Town meeting format in which "soft" supporters, selected by the Gallup Organization, will question the candidates. Moderator: Charles Gibson - Co-Anchor, ABC News Good Morning America. 9:00-10:30 p.m. EDT Format: Candidates at podiums. Focus primarily on domestic policy. Moderator: Bob Schieffer -CBS News Chief Washington Correspondent, and Moderator, Face the Nation. On Jan. 6, 2003 the CPD posted 2004 site selection criteria. There was a March 31, 2003 deadline for prospective hosts; on April 24, 2003 CPD announced that it had received proposals from fourteen potential 2004 debate sites. On Sept. 24, 2003 the CPD announced 2004 candidate selection criteria; it is using the same three criteria as in 2000. On Nov. 6, 2003 the CPD announced proposed 2004 sites and dates. On June 17, 2004 the CPD announced formats for its proposed 2004 debates. On July 15, 2004 the Kerry-Edwards campaign announced its acceptance of the CPD's 2004 debate schedule. On Aug. 13, 2004 the CPD announced moderators for its proposed 2004 debates. On Sept. 20, 2004 James A Baker, III and Vernon Jordan, Jr, the campaigns' debate negotiation team leaders, announced they have reached an agreement for the candidates to hold three presidential debates and one vice presidential debate. There is no requirement that presidential candidates participate in debates, but it would be quite damaging to be seen as avoiding or blocking the debates, particularly since the candidates are taking federal funds. Typically every four years there is a ritual debate over debates. For several weeks the two major campaigns jockey back and forth haggling over details big and small--everything from the number and format of the debates to the podium height and shape and who is or is not acceptable as a moderator. Closed-doors meetings alternate with pointed public pronouncements, but eventually the two sides reach an accord. Mark Wallace (BC04 deputy campaign manager) Kerry-Edwards 2004, Inc. In 2004, aside from an early report that the Bush campaign might skip the proposed St. Louis debate and agree to only two presidential debates, as President Clinton had done in 1996, negotiations were conducted in quiet and without posturing. Although the CPD did get a bit nervous (Sept. 15 letter) the negotiating teams announced on September 20 agreement for three presidential debates and one vice presidential debate, almost exactly as the CPD had proposed. (One minor adjustment made, reportedly at the behest of the Bush campaign, was to have the first debate focus on foreign policy rather than domestic policy as the CPD had proposed. In other changes from the CPD proposal, the September 30 and October 13 debates were held with the candidates at podiums rather than seated at a table with the moderator, and the October 8 town hall featured questions from "soft" supporters rather than undecided voters). In a commendable and unprecedented sign of openness, the campaigns released the full Memorandum of Understanding [PDF] outlining the terms of the debates. The format of a debate has a critical impact on nature of the exchanges that occur and on the amount of information viewers are able to learn. The most obvious parameter to consider is who is on the stage and who is not, but there are many other factors. Is there a live audience and are they controlled or disruptive? Is the subject matter confined to one area, such as the economy, or is it more wide-ranging? What is the time limit on candidate responses and on rebuttals? Finally, who asks the questions? The 1960 and 1976-1988 presidential debates exclusively used the panel of reporters. More recently the single moderator and town hall formats have come into favor. The town hall format was first used in the Richmond, VA debate in 1992. Having an audience of undecided voters pose the questions likely results in a broader range of questions, but on the downside this format does not foster follow-up. One format which has not been attempted is to have the candidates question each other directly. In the lead up to the debates, the candidates undergo intensive preparations. Briefing books are put together, and the candidates engage in mock debates. The media provide glimpses of these rehearsals. The candidates will also be sure to be seen engaging in public displays of confidence such as throwing a baseball, jogging, or giving a thumbs up. Following each debate occurs one of the most unique and fascinating scenes in American politics. Top campaign staff, campaign surrogates and party leaders gather in the media filing center and spin reporters, telling them what they have just seen. On opposite sides of the filing center chairs are set up for Democratic and for Republican partisans to do satellite interviews with local stations around the country. Meanwhile, a rapid response unit has been working feverishly to produce rebuttals to various claims made during the debate; these documents are distributed and faxed out. In 1988 media were criticized for giving too much attention to the spinners. Spin soundbites still form an integral part of coverage, but another common element is to assemble a group of undecided voters and interview them for their reactions. 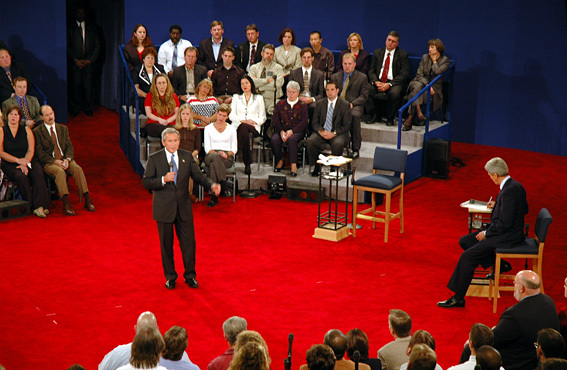 As in 1996 and 2000, the Commission on Presidential Debates ran a Debate Watch program to encourage debate-watching groups around the country. According to the Commission over the four debates more than 30,000 people participated in an estimated 2,003 groups around the country. These groups provided convenient opportunities for local media to do debate coverage. Critics charge that the CPD, headed by the former chairs of the Democratic National Committee and the Republican National Committee, is a bipartisan rather than a nonpartisan organization, and can scarcely be expected to be fair to third party and independent candidates. They also maintain the CPD lacks transparency. (c) have a level of national support of at least 15 % as measured in polls done by five selected national polling organizations. Third party candidates have raised strong objections to the 15 % threshhold, arguing that it is arbitrary and too high. In the 2000 cycle, Pat Buchanan/Reform Party, Dr. Lenora Fulani's Committee for a Unified Independent Party, John Hagelin/Natural Law Party, and Ralph Nader all filed lawsuits seeking to gain entry into the debates, all to no avail (see the 2000 debates page). Third party candidates and parties filed an administrative complaint with the FEC on June 17, 2003 charging that the CPD is a partisan group and that therefore cannot finance the debates with corporate funds. This complaint would not be resolved until long after the debates and the election. After the FEC failed to act in a timely manner, attorneys filed suit in the U.S. District Court for the District of Columbia on Feb. 11, 2004. (press release). On Aug. 12, 2004 U.S. District Judge Henry H. Kennedy, Jr. ruled (Hagelin et al. v FEC) that the Federal Election Commission had to investigate the charge that the CPD is a partisan group. The FEC filed a motion to stay the decision pending appeal. The District Court granted this motion on Oct. 6. The matter then went to the U.S. Court of Appeals for the District of Columbia, which on June 10, 2005 issued a ruling siding with the FEC and reversing the District Court ruling. Attorneys for Hagelin et al. did not give up; they asked the Appeals Court to reconsider its decision, but on Aug. 9, 2005 the Court reissued its opinion, effectively ending the matter. Meanwhile on Oct. 1, 2004 the Arizona Libertarian Party filed suit against Arizona State University and the CPD in the Superior Court of Arizona for Maricopa County charging that ASU, a state entity, was "making a donation to two individual campaigns [Bush and Kerry] through the Commission on Presidential Debates as a conduit, in violation of the Arizona Constitution's prohibition on making gifts or donations to individuals or corporations." Judge Pendleton Gaines issued an Order to Show Cause for the president of ASU and the director of the CPD to appear in court for a hearing on October 12, one day before the scheduled debate. The Arizona debate nonetheless proceeded. At the debate in St. Louis on Oct. 8, Libertarian nominee Michael Badnarik and Green nominee David Cobb were arrested as they crossed a police line. Additionally, on Feb. 14, 2004 Open Debates filed a complaint with the FEC alleging "that presidential debates sponsored by the CPD are controlled by the major parties in violation of FEC debate regulations." The Open Debates complaint sought to have "the FEC prohibit the CPD from staging future corporate-sponsored presidential debates." And on April 2004 Open Debates filed a complaint with the IRS in an attempt to revoke the tax status of the Commission on Presidential Debates (CPD). In a March 13, 2004 speech in Quincy, Illinois, presumptive Democratic nominee Sen. Kerry proposed "a series of monthly debates, starting this spring." (During his 1996 re-election campaign Kerry had held a series of eight debates with his Republican challenger Bill Weld from April to October). In the past there have been unsuccessful attempts by a few members of Congress to legislate the question of participation. For example in Nov. 2001, Rep. Jesse Jackson Jr. (D-IL) introduced a resolution that sought to lower the threshhold for participation to 5 % (H.C.R. 263). Note: Brown is Walt Brown the Socialist Party candidate; Jay is Charles Jay, candidate of the Personal Choice Party; stand-ins were Gary Nolan (LP), Jerry White (SEP) and Dierdre Griswold (WWP). Green Party nominee David Cobb assidiously participated in these forums, Libertarian Party nominee Michael Badnarik missed one, Constitution Party Michael Peroutka did only one forum, and Ralph Nader eschewed them altogether. C-SPAN covered a couple of these events. Note: 2000, 1996, 1992 and 1988 debates sponsored by Commission on Presidential Debates; 1984, 1980 and 1976 sponsored by the League of Women Voters; 1960 sponsored by the networks. Copyright © 2001, 2002, 2003, 2004, 2005 Eric M. Appleman/Democracy in Action.